This article will teach you how to increase yields & potency of your home-grown cannabis without going crazy on your electricity bill! So here's the question: Considering the grow lights you have now, what should you get next to upgrade your yields and potency? If you don't have any cannabis grow lights yet, this guide will also help you decide which one is right for your space and budget! Skip the Intro! Which Grow Lights Do You Have Now? Important Note: If you haven’t already mastered the basics of growing and learned about free plant training methods to increase yields, these are likely a better place to start than upgrading your grow lights. Getting through your grow without major problems and training your plants to grow more efficiently will give you bigger yields for free, without having to upgrade your grow lights. When you've already maxed out on the yields you can get in your space, or if you're interested in improving the overall quality of your harvested buds, one of the best and easiest way to improve your grow is to upgrade your grow lights. 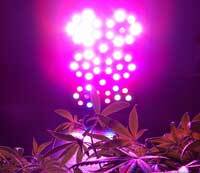 Watt-for-watt, most grow lights give off about a similar amount of heat. Some lights are more efficient than others (for example HPS is more efficient than CFLs, and will produce more light and less heat for the same amount of electricity), but when it comes to determining heat, wattage is a good way to generally estimate how much heat is going to be generated in your grow room. That means that 400W of CFLs will produce a comparable amount of heat as 400W worth of HPS or LEDs. One of the big differences is how each of the types of lights dissipate extra heat. While some MH/HPS lights are installed as a naked bulb under a reflector (cheap “wing” style HPS hoods), MH/HPS lights are often encased within an enclosed hood that allows the grower to hook up the light system directly with ducting so an exhaust fan can be used to expel the heat. 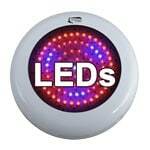 LED models are usually built with heatsinks and/or built-in fans to help disperse the heat evenly without concentrating any heat directly on the plants. Even with these extra bells and whistles, it’s still important to use an exhaust system to get rid of extra heat unless it’s naturally cold in the grow room. CFLs unfortunately don’t have any built-in way to disperse heat because they were not originally intended to be grow lights (or used in huge numbers like they are in most CFL grows). 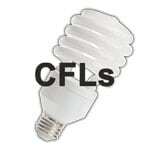 With CFLs, the main way to deal with heat is to keep the grow very small or disperse heat with an exhaust system. Warning! Be wary of crazy claims! If something sounds too good to be true about a grow light, it probably is! Especially when it comes to LED grow lights, there is a lot of misinformation out there. The truth is that when it comes to growing cannabis, LED grow lights are not currently more efficient than an HPS light when it comes to yields/watt. 400W of HPS will almost always get more yields from cannabis than 400W of LED. When it comes to improving your yields, the most efficient grow light is an HPS. When I say "efficient," I mean the amount of usable light produced for the amount of electricity needed. Because HPS lights are so efficient, using an HPS light during your cannabis flowering/budding phase is the fastest way to improve your yields. When it comes to improving your potency, LED grow lights seem to help the plant produce more trichomes and bring out the natural odor of the plant, and many growers believe the overall quality and potency of buds is increased when using LED lights during the flowering stage. A combination of HPS and LEDs seems to provide some of the best benefits of both – big yields plus high quality and potency. This may be because a combination of HPS plus LEDs more closely mimics the autumn sunlight that cannabis plants are exposed to in the wild. Cannabis plants can use a lot of light, and this upgrade guide will help you figure out the best way to upgrade your grow lights in your budget, but there comes a point when adding more light just doesn’t increase yields any more. Please note: The further your grow light from the plants, the less powerful the brightness but the greater and area the light will cover. The key is finding the right type of lights that give you both the coverage and brightness you need to achieve your goals. At some point, cannabis hits a saturation point and just can’t use any more light. This usually happens when a grower has more than 100W of grow lights per square foot. This also can happen when the grower keeps powerful lights very close to plants. In this case, you can actually increase yields even further by sealing your entire grow area supplementing with CO2. Just remember that adding extra CO2 to your grow room is a waste of time and money unless you’ve hit the maximum amount of light that your plants can use, and you will have to completely seal off your grow area (so it’s basically airtight) in order to supplement with CO2 effectively. It’s important to note that while supplementing with CO2 may increase your yields, it does not affect the quality or potency of your buds..
What Grow Lights Do You Have Now? If you have less than 150W worth of grow lights in total, your grow is underpowered for cannabis growth (even for just one plant). 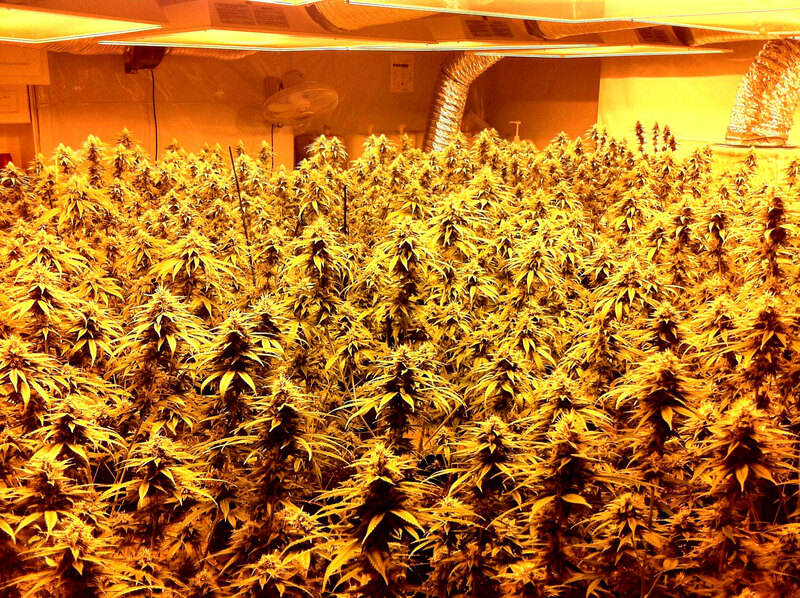 Cannabis plants need a lot more light than many other types of plants. If you don’t have at least 150W worth of lights, it’s important you add more total grow light wattage to your grow room to make sure you’re giving your plants as much light as they need to grow successfully. If you have at least 25” (64 cm) + size of your plants in their containers, you should upgrade to MH/HPS or upgrade or an LED grow light. A general rule is you should have at least 5 feet (1.5 meters) of height for smaller MH/HPS setups or an LED panel, and 6 or 7 feet (~ 2 meters) of height for a larger MH/HPS setup. If you don’t have enough vertical height for better grow lights, you can usually still upgrade your CFL setup to get more yields in the same space by changing the type of CFLs and how you arrange them around your plants. If height and stealth are a big issue, learn more about growing cannabis in small spaces with Space Buckets. If you have at least 150W of grow lights, but haven’t already mastered the basics of growing and learned about free plant training methods to increase yields, then you might want to consider mastering these first. 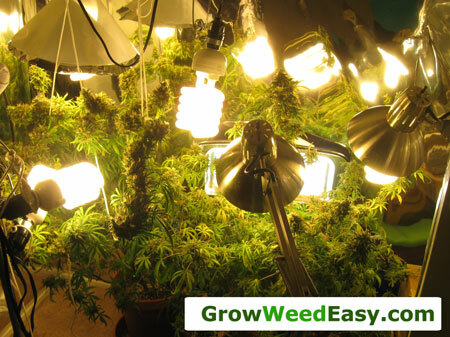 Training your plants to grow better and without major problems will give you bigger yields, for free, without having to upgrade your lights or setup in any other way. The only other time you should not upgrade from CFLs to a better grow light is if height is an issue. One of the biggest benefits of CFLs (and fluorescents) is they need less height than nearly any other grow light. If you are severely limited by height, than CFLs (and possible very small LEDs) are your best option. Why Upgrade to a Better CFL Setup? Get better results for the same amount of electricity used by changing the type of CFL bulbs you use, and arranging them around your plant differently. Be able to grow cannabis plants even when height is very limited (when you have very little up-and-down room for your plants and lights). Get much better results and bigger yields for the same amount of electricity used. Once you’ve got at least 150-250W (or more) of CFLs, you will dramatically increase your yields by switching to a small MH/HPS, because MH/HPS lights are much more efficient (produce more light for the same amount of electricity) than CFLs. 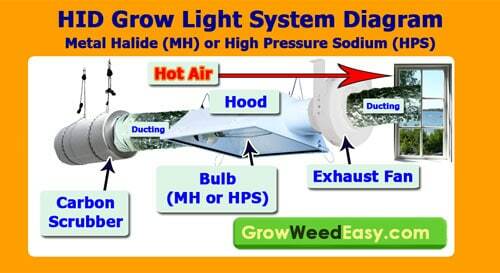 Learn more about CFLs vs MH/HPS grow lights. If you keep the same total number of watts as with your current CFL setup, an MH/HPS grow light will not give off more heat than the setup you have now, but will come with additional cooling options. MH/HPS grow lights have a reputation for giving off a lot of heat, but 150 watts of CFLs will give off about the same amount of heat as 150W of MH/HPS. If you upgrade to MH/HPS, you can finally stop worrying about having to adjust your CFL lights all the time. MH/HPS lights rarely need to be adjusted compared to CFLs, and are conveniently able to be hung directly above the plants. No need for crazy contraptions to make sure all your CFLs are within just a few inches of your plants! Gain the ability to grow bigger and taller plants. If you upgrade to LEDs, you can finally stop worrying about having to adjust your CFL lights all the time. If you keep the same total number of watts, LEDs will not give off any more heat than the setup you have now, but will come with additional cooling options like heatsinks and built-in fans. Many growers believe that LEDs seem to produce higher quality buds (more trichomes, higher potency, and they bring out the natural taste and smell of buds) than any other type of grow light. Once you’ve got at least 150-250W (or more) of CFLs, you will dramatically increase your yields by switching to a small LED panel. Important Note about LEDs: LEDs are a popular choice for upgrading grow lights from CFLs, though it’s important to realize that good LED grow lights are still very expensive, and also that 400W of LED is not going to give you more yields than 400W of HPS, no matter what the manufacturer claims about equivalency. Unfortunately when it comes to growing cannabis, multiple tests by growers demonstrate that LEDs don’t live up to the hype of somehow magically increasing yields with far less power. Most tests indicate that yields/watt are actually higher with an HPS light in the flowering stage than LEDs. The price for LEDs is dropping each year, but remember they’re still very pricey compared to a similar wattage MH/HPS light. The most straightforward way to upgrade an MH/HPS setup is to increase the total amount of grow light wattage to your grow room during the flowering stage. One way is to add LEDs to your existing setup. Some growers believe that combining MH/HPS with a quality LED panel may be able to improve the quality of your harvested buds, and LEDs seem to perform better with HPS than they do by themselves. If you’re most concerned with improving your yields, skip the LEDs and get more HPS power for your flowering stage. This can be accomplished either by upgrading to a bigger bulb or by adding additional MH/HPS units. Adding extra MH/HPS power will tend to give you a bigger return on yields than adding similar wattage of LEDs. If you haven’t already mastered the basics of growing and learned about free plant training methods to increase yields, you should focus on those factors first. 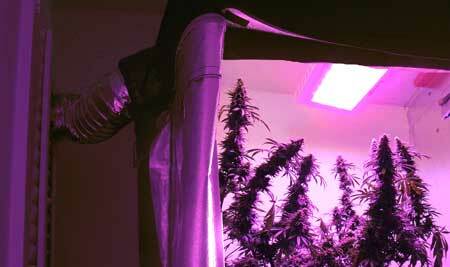 Training your plants to grow better will give you better yields without having to upgrade your lights. When you are already having trouble with heat, you shouldn’t add more grow light wattage to your setup until you get your heat under control. By keeping temperatures relatively low during the flowering stage, you will actually increase the potency of your buds and achieve a better smell. Learn about how temperature affects your cannabis plants. Why Upgrade The Exhaust System and Control Temperature? It’s important to keep the temperature of your grow area under 80°F (26°C) throughout the flowering stage to prevent some of your potency and natural smell of buds from “burning away.” Note: The only exception to this rule is if are supplementing with CO2 in a completely sealed room (which you should never do until you have already maxed on on the amount of light your plants are able to use, so CO2 isn’t a good option for most small-scale growers). A properly calibrated exhaust system will help keep temperatures around 65-80°F (18-26°C) while buds are forming, maximizing on the final quality and potency of your buds. A better exhaust system helps keep humidity low during the flowering stage, which increases the number of trichomes formed on your buds, especially towards the last few weeks before harvest. An effective exhaust system will help growers achieve slightly cooler temps at night (during the dark period), which brings out the natural colors and taste/smell of your strain. 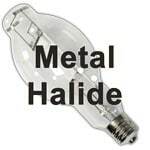 Adding higher wattage MH/HPS bulbs to your grow room (or increasing the number of MH/HPS units) is the most cost-effective way to increase your yields. Why Add LEDs To Your Existing Setup? Many growers believe that LEDs seem to produce higher quality buds (more trichomes, higher potency, and they bring out the natural taste and smell of buds). The best results seem to come from mixing both HPS and LEDS in the flowering stage. What About Switching Away From MH/HPS To LEDs? If you’re thinking about switching away from MH/HPS altogether, and want to switch entirely to LEDs, it’s important you understand that good LED grow lights are still very expensive, much more expensive than purchasing an equivalent MH/HPS. The price for LEDs is dropping each year, but they’re still very pricey compared to a similar wattage MH/HPS light. Most LEDs are made to disperse heat in the grow area, which can prevent hot spots from forming directly on your plants. However, LEDs do get hot, and if you have a lot of them you will need to install an exhaust system to keep temps from getting too high and hurting your plants. One big benefit of switching directly from MH/HPS to LEDs is that many growers note an increase of overall quality of their buds, even though yields may be lower. Add MH/HPS to your setup to increase your yields dramatically. Another option is to upgrade to better LEDs than the ones you have now. If you have less than 150W worth of grow lights in total, your grow is underpowered for cannabis growth (even for just one plant). 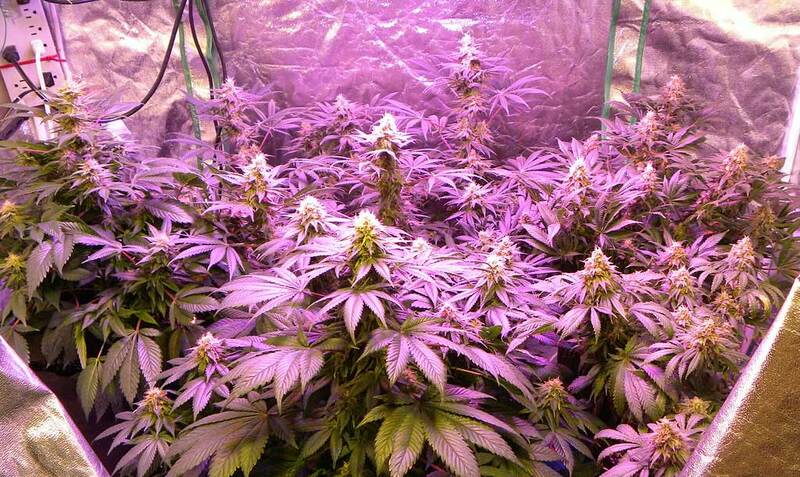 Cannabis plants need a lot more light than many other types of plants. If you don’t have at least 150W worth of lights, it’s important you add more total grow light wattage to your grow room to make sure you’re getting the best results you can. 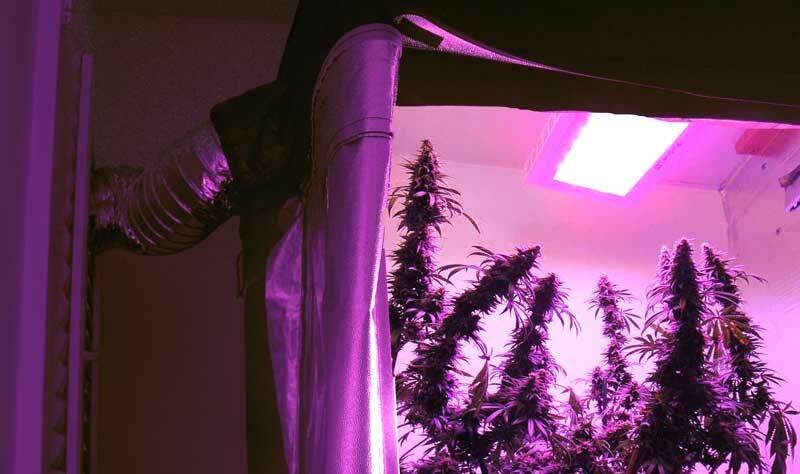 If you have at least 150W of quality grow lights, but haven’t already mastered the basics of growing and learned about free plant training methods to increase yields, you should consider mastering those methods first. It will give you bigger yields for free, without having to invest any more money in lights. When you are already having trouble with heat, you shouldn’t add more lights to your setup until you get the temperature under control. By keeping temperatures relatively low during the flowering stage, you will actually increase the potency of your buds and achieve a better smell. Learn about how to lower temps with a stealthy exhaust system. It’s important to keep the temperature of your grow area under 80°F (26°C) throughout the flowering stage to prevent some of your potency and natural smell of buds from “burning away.” Note: The only exception to this rule is if are supplementing with CO2 in a completely sealed room (which you should never do until you have already maxed on on the amount of light your plants are able to use, which is unlikely for most small-scale growers). An effective exhaust system will help growers achieve slightly cooler temps at night (during the dark period), which brings out the natural colors and smell/taste of your strain. 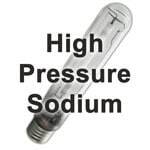 Why Add MH/HPS To Your Existing Setup? Adding MH/HPS to your grow room to supplement your LEDs is the most cost-effective way to increase your yields. There are also a lot of growers who believe the best results as far as bud quality seem to come from mixing both HPS and LEDS in the flowering stage. So far no grow lights (not even LEDs) are able to consistently beat HPS grow lights in flowering when it comes to getting the biggest yields for the amount of electricity used (though some of the recent high-powered LED models with large chipsets are beginning to come close). 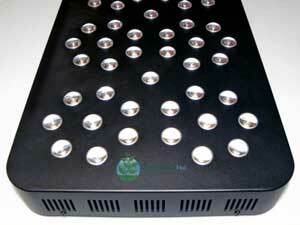 Poor quality LED grow lights tend to cause problems with proper growth in either the vegetative or flowering stage. If your plants aren’t growing properly under your LEDs, it’s possible they are not the right kind of LED grow lights for growing cannabis. 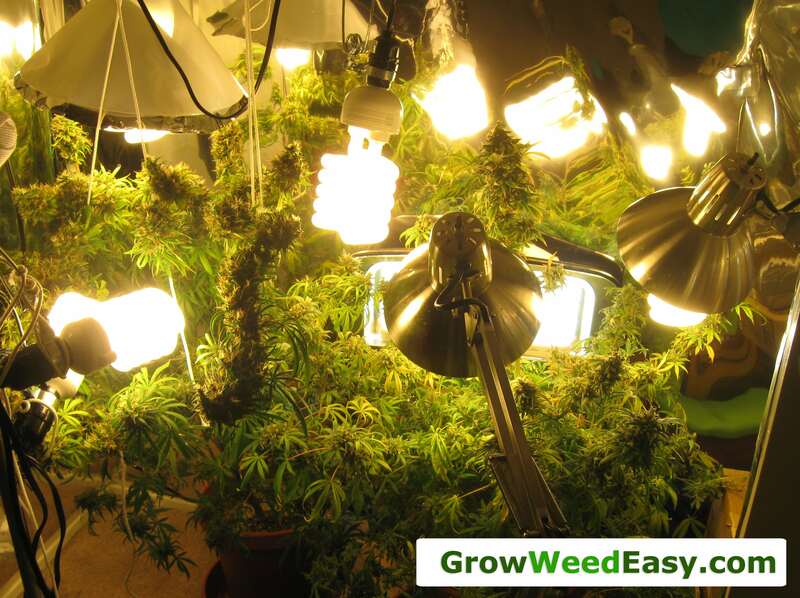 More wattage of LEDs gives you the ability to produce bigger yields. Cannabis plants love a lot of light, and they power the growth of buds with energy produced from light. Many growers believe that LEDs seem to produce higher quality buds (more trichomes, higher potency, and they bring out the natural taste and smell of buds). Genetics Are Key to Potency & Yields! While all the tips and tactics for upgrading your grow lights will help increase your yields with any strain, the genetics of your plant also play a huge role in how the plant grows, how the buds fatten, bud potency and ultimately your yields. The strains available today get much higher yields and are much more potent than any strains that were around even a decade ago. If you've got cannabis seeds that have been sitting around for a few years, chances are they are not as potent as seeds from a newer strain. Strain potency, yields, and ease of growth have been improving steadily over the last several decades as hundreds of growers around the world are constantly breeding new strains and improving on old favorites. and get the strain you've always wanted! So even if you do everything right to get bigger yields, you may not get buds as big as the ones you see online or in cannabis magazines. It's an unfair comparison if you're using so-so genetics. Investing in a high-yielding strain can be one of the best ways to increase your final yields (as well as the overall quality, potency and smell of your buds!). 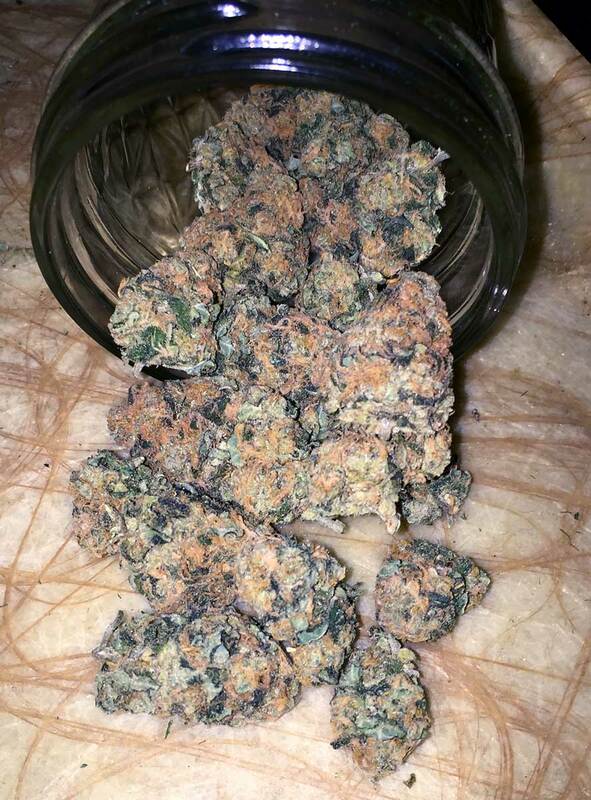 Already got your strain? 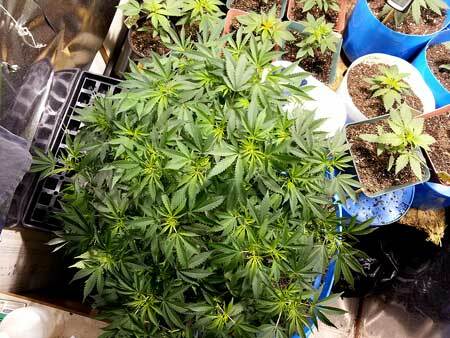 Learn 5 Ways to Increase Yields Indoors (with any strain)!